Vertical comparison of Olympus Mons with Mount Everest (shown sea-level-to-peak) and Mauna Kea on Earth (measurement is sea-level to peak, not base to peak). ↑ "အိုလံပတ်တောင်". Gazetteer of Planetary Nomenclature. USGS Astrogeology Research Program. ↑ "Morphometric Properties of Martian Volcanoes" (2004). J. Geophys. Res. 109. doi:10.1029/2002JE002031. Bibcode: 2004JGRE..109.3003P. ↑ Frankel, C.S. (2005). Worlds on Fire: Volcanoes on the Earth, the Moon, Mars, Venus and Io; Cambridge University Press: Cambridge, UK, p. 160. ISBN 978-0-521-80393-9. ↑ Frankel, C.S. (2005). Worlds on Fire: Volcanoes on the Earth, the Moon, Mars, Venus and Io; Cambridge University Press: Cambridge, UK, p. 132. ISBN 978-0-521-80393-9. ↑ Layers in Olympus Mons Basal Scarp (PSP_001432_2015), High resolution imaging Science Experiment. ↑ Hanlon, M. (2004). The Real Mars; Constable & Robinson: London, p. 22. ISBN 1-84119-637-1. 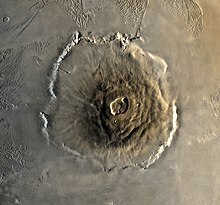 ↑ Martian Volcanoes on HST Images How Far Could I See Standing on Olympus Mons, "2.37 miles", Jeff Beish, Former A.L.P.O. Mars Recorder Archived August 27, 2009, at the Wayback Machine. ↑ Public Access to Standard Temperature-Pressure Profiles Archived 2007-06-21 at the Wayback Machine. Standard Pressure Profiles measured by MGS Radio Science team at ၂၇ km (၁၇ mi) range from approximately 30 to 50 Pa.
↑ Hartmann, W.K. A Traveler’s Guide to Mars: The Mysterious Landscapes of the Red Planet. Workman: New York, 2003, p. 300.